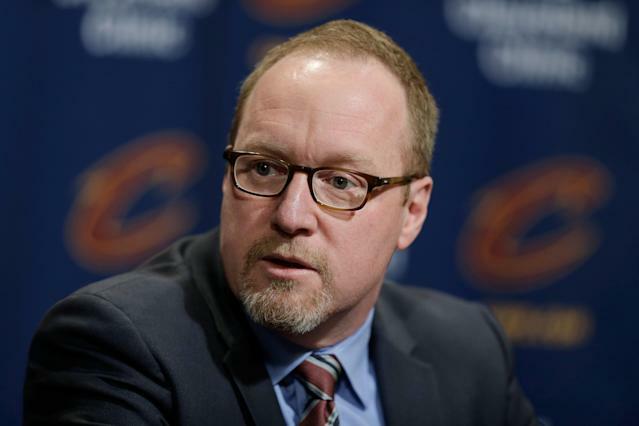 The New Orleans Pelicans officially introduced David Griffin as their president of basketball operations Wednesday. The former Cleveland Cavaliers general manager takes over one of the NBA’s hottest story lines in what will happen to superstar Anthony Davis. Davis made a trade demand midseason and there’s expected to be a bidding war for the center. Griffin has not yet spoken with Davis, per Will Guillory of The Athletic, but has a plan moving forward after speaking with Davis’ agent, Rich Paul. Griffin shared thoughts during a press conference introducing him. Griffin mentioned a “long successful history” with Rich’s company, Klutch Sports, per Andrew Lopez of the New Orleans Times-Picayune. Griffin was the Cavaliers general manager during their 2016 NBA championship and lured LeBron James back home from the Miami Heat. He was the runner-up for the 2015 NBA Executive of the Year award. Griffin said he committed to New Orleans because he believed in owner Gayle Benson. The new head of basketball operations said he had spoken with 10-year veteran Jrue Holiday, who he said he “absolutely” considers to be a foundation building block for the franchise. David Griffin: I'm excited about the young guys and a player on our that exemplifies who we want to be in Jrue Holiday. The point guard played the last six years of his career with New Orleans, averaging 13.4 and 5.8 assists.